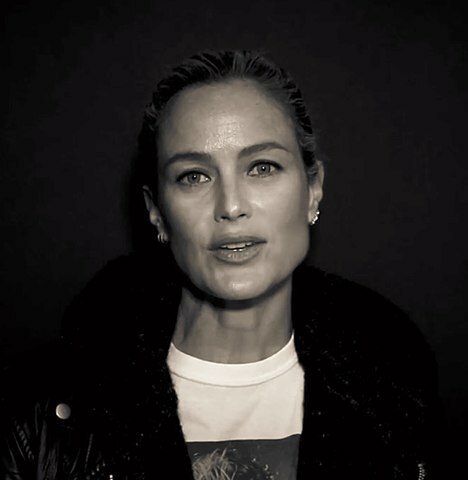 Carolyn Murphy was born in Panama City, Florida, U.S., on August 11, 1974, is an American model and actress. She began her modeling career at the age of 16, was discovered by Mary Lou's Models. Carolyn was considered a muse by Calvin Klein. She is one of the top-earning models on the Forbes list. Long time highly ranked on Industry Icons and The Money Girls List by models.com. Featured on the cover of the Sports Illustrated Swimsuit Issue in 2005. She appeared in the 1998 and 1999 Pirelli Calendar. Was named VH1/Vogue's Model of the Year in 1998. She was married to businessman Jake Schroeder (1999-2001), they had one daughter, Dylan Blue. She dated Dutch model Mark Vanderloo. She dated American musician Brandon Boyd (2002-2006). Lives in Venice Beach, California. She made her big screen debut in drama romance film Liberty Heights (1999) in role as Dubbie the Blonde. She appeared in TV Series Project Runway All Stars (2012-2013). Featured in documentary film Mademoiselle C (2013). Lui Magazine France, Elle Germany, The Edit, Elle Italia, Vogue Italia, Pirelli Calendar, Harper's Bazaar, Tatler Russia, Gap, Vogue Japan, Numero Tokyo, Madame Figaro, Vogue Australia, Numero China, Vogue Germany. Oscar de la Renta, Estee Lauder, Max Mara, El Palacio de Hierro, Moschino, Massimo Dutti, Blackglama, Louis Vuitton, Carlo Pazolini, Gap, Tiffany & Co., Cesare Paciotti, Roberto Cavalli. Walked runway for Michael Kors, Vionnet, Calvin Klein, Marchesa, Jason Wu, Balenciaga, Anna Sui. Represented by agencies IMG New York, Paris and Milano, Tokyo Bon Image Corp. I had dreamed of visiting Bali for many years and because I had an extended family of Balinese friends in Los Angeles, I felt connected. I never thought I'd make the pages of 'Sports Illustrated,' because I've always been skinny. I just remember Stella Tenant and me dancing in Donatella Versace's bathtub until like four in the morning. It was one of those 'pinch me' moments.